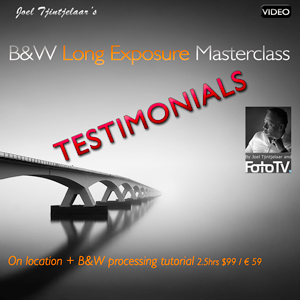 Since my Long exposure and B&W masterclass video tutorial series, produced with FOTOTV.COM (world’s largest WebTV about photography) has been released in May 2013 I’ve had the pleasure of receiving many emails and comments on this series from customers all over the world. I’ve decided to collect some of the testimonials, posted all over the Internet, in this post to give you an impression. Just scroll down the page and see for yourself. Hope you are well and taking plenty of those stunning shots you produce. After watching your videos and producing my first architecture image in June, I have now reached the grand total of 16 architecture images so far. Some I like better than others but overall, I am still thrilled with the skills you gave me on your videos and excited by the joy I now get from architecture. I simply wanted to touch base with you and share my gratitude to you for creating the BW Masterclass Series. In my latest image of The Getty Center, I followed along with the videos to help bring about my vision for the composition. The techniques you share are without a doubt the best way to create the smoothest most natural gradients in an image. Now, last question, What do I do with all these images…. lol? Hey Joel, Thanks for your video which gives an insights into how your work and process images. i am at a very novice stage in my photography and i am so keen to learn and become an expert in this genre of black and white long exposures. One criticism if i may, is that a portion of your video which explains how you import images from Nik silver Efex pro is not definitive enough. please if possible next time for futures videos, make a step by step process of how you go about this as i felt that this part was rushed. i live in the UK and would like to save up and come for a photoshop class over a weekend if possible. How much do you charge for your classes? I really appreciate the videos. All the chapters are very insteresting whether it is about on site shooting or post processing. I won’t say that those ones are worse than Joel’s tutorials, this is simply that Joel videos fits perfectly my need (espacially when it cames to long exposure for landscape) and all the explanations provided are clear. However I would have been even happier if Joel have included a dedicated chapter on printing in black and white since I think that there is definitely something to do in this area. Another question is about how Joel generates its 3 copies of the same image (Highlight, Low Light and Normal). It appears that they came straight from Nik almost without processing. Do you some time tweek thoses 3 versions or does it came straight from Silver Efex proposals? Do you use for example from time to time color filters in Silver Efex or photoshop Color to B&W conversions tools. Great work, I will definitely take look at your future book. I purchased your ‘B&W Long Exposure Masterclass’ video last week. I enjoyed watching it and got some really fantastic tips and advice. Here’s my first real attempt using the new knowledge I gained from your teachings. Thanks Joel Tjintjelaar. I’m working on your videos. I find them informative, very well structured and… really inspiring. Your work and your lessons increases my interest in photography, that is in trying to draw with ligh the world arround us. Jeremy Sargent Just purchased and looking forward to getting into this along with the time lapse course! Hopefully two more steps towards being where I want to be with my LE work! Thanks Joel. Wolfgang Trust · I have known your technique from other short tutorials but decided nevertheless to purchase this masterclass tutorials. Despite the discount it is not cheap, but for me it is worth the price. Especially your complete approach from vision to the final picture. Thank you Joel for sharing your knowledge and the inspiration. The New Gold Standard in Fine Art PhotographyI just had a chance to complete this video tutorial series, and I got so much out of it. I was blown away by how concise, easy to follow, and comprehensive this was. Anyone pursuing fine art photography needs to master these techniques. I believe a new “gold standard” is being created right before our very eyes. If you have not done so, get these tutorials. I have not mastered these techniques, but I know the challenge will help me to grow by leaps & bounds.I don’t think most people realize that I have only had a camera since 2011. I had no real experience with photography prior to meeting +Joel Tjintjelaar online. I never had a camera as a child or teenager. Photography still has that “new car smell”. I marvel at what is possible with this craft. I say this because I know without a shadow of a doubt that studying Joel’s techniques and going to his workshops have helped me to advance in a way that I never could have on my own. These tutorials have given me the vocabulary needed to express myself through visual communication.I have so much more to learn and grow in my photographic journey. It has changed me as a person. For the better Not just my view of the world & it’s people, but my heart. I never want to do “straight shots”, or be a button pusher. I am only interested in creating inspired work that comes from my heart, feeds my soul, and serves the world. Hallelujah!!! This is a very good thing!! Steve Sickels I’ve watched 5 of the segments so far — great stuff, Joel! Just watch video 3. I’m excited to retake this shot here in SF. The videos are very well done, enough info Imparted at a leisurely pace and not oversaturated for my f22 size brain. Now on to that 6 stop filter. I just turned the heat on in my place Joel. Your video may be more effective than you think! Heel graag wil ik je bedanken voor de prachtige BW Masterclass video tutorial, de kwaliteit is verbluffend. Eveneens dank om je kunde met ons te delen. Een must have voor al wie passioneel met fotografie bezig is. Conversation started May 23 May 23Sal VirjiHi Joel, Thank you for introducing the master class video, I really did enjoying watching it and learning a lot of new ideas and techniques from, really appreciate it.It was also a pleasure watching you work and explain things so well, you seem like a wonderful person and very down to earth.After watching your master class videos I did try applying it to one of my old images that I found on my pc, when free do have a look if you can.Have a wonderful day.Sal. Hey Joel! Love your videos! I’m about half way through! Damn! You are a better man than me! Actually I could see you were not 100%. Video still rocked! I’ve watched this Masterclass, a couple of times in fact, and would definitely recommend it to anyone that wishes to create the kind of images you’ve seen here. They are clear, concise, and a pleasure to watch. In fact the more I watch them, the more I want to get out and shoot ! +Joel Tjintjelaar I’ve watched a couple of episodes and I’ve found it very informative, looking forward to watching some more! A wonderful introduction to a whole new way of viewing the world. Many Thanks. Can just recommend it! Have been watching all the chapters this week during travels and I can only say that I am longing to get out shooting and post process some images again. Especially the chapters about your vision with the images and how you create more presence is just great and very inspiring! Just finished the series !! Phenominal tutorials !! Just want to say a massive thank you! The masterclass is brilliant!’ive I taken a massive learning curve on the tips you have brought up and the work flow you show, it’s really incredible . All the tutorials you have done are simple and straightforward to follow. I haven’t fully mastered the techniques, but feel much more confident and taken a massive leap forward towards creating great fine art shots. for anyone considering this tutorials: you will not be disappointed, they are worth every penny! Many thanks Ross, good to hear you’re learning a great deal from it.